If you are considering it for your camcorder - please check out NP-FS21 - it will provide twice the runtime. 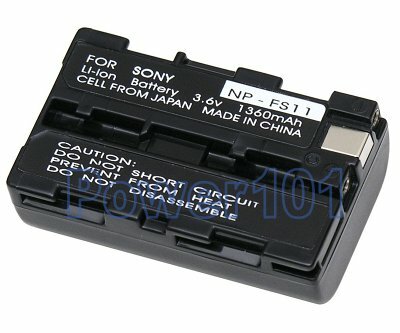 This battery is compatible with the following Sony cameras: Sony CyberShot DSC-F505, DSC-F55, DSC-P1, DSC-P20, DSC-P30, and DSC-P50. It is also compatible with the following camcorders: Sony CCD-CR1, CCD-CR1E, DCR-PC1, DCR-PC2, DCR-PC3, DCR-PC4, DCR-PC5, DCR-TRV1, and PCR-TRV7. Please use our camera / camcorder battery finder if yours is not listed here. 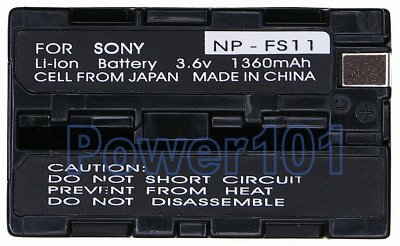 These batteries can be charged by any standard chargers compatible with FS11 batteries. Such as the charger that came with your camera.